Climate proxy records from the middle to high latitude Southern Hemisphere indicate that a Lateglacial (15,000-11,500 years ago) climate reversal, approximately coeval with the Antarctic Cold Reversal (ACR), interrupted a warming trend during deglaciation. 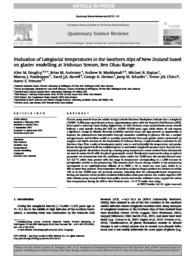 In New Zealand, some palaeoclimate proxy records indicate a cool episode during the ACR (ca 14,500-12,500 years ago), while others do not express a significant change in climate. Recently published moraine maps and ages present an opportunity to improve the palaeoclimate interpretation through numerical modelling of glaciers. We use a coupled energy-balance and ice-flow model to quantify palaeoclimate from past glacier extent constrained by mapped and dated moraines in the headwaters of Irishman Stream, a high-elevation catchment in the Southern Alps. First, a suite of steady-state model runs is used to identify the temperature and precipitation forcing required to fit the modelled glacier to well-dated Lateglacial moraine crests. Second, time dependent glacier simulations forced by a nearby proxy temperature record derived from chironomids are used to assess the fit with the glacial geomorphic record. Steady-state experiments using an optimal parameter set demonstrate that the conditions under which the 13,000 year old moraine formed were 2.3-3.2 *C colder than present with the range in temperature corresponding to a +/- 20% variance in precipitation relative to the present-day. This reconstructed climate change relative to the present-day corresponds to an equilibrium-line altitude of ca 2000 +/- 40 m above sea level (asl), which is ca 400 m lower than present. Time-dependent simulations of glacier length produce ice advance to within 100 m of the 13,000 year old terminal moraine, indicating that the chironomid-based temperature forcing and moraine record provide consistent information about past climate. Our results, together with other climate proxy reconstructions from pollen records and marine sediment cores, support the notion that temperatures during the ACR in New Zealand were ~2-3 *C cooler than today.